It was with some amount of dread that I began reading The Last Battle - the final book in the Narnia series - to my children. Bookworm1 was interested to dive on in because it was the only Narnian story that he had not heard. He was ready to listen because he didn't know what was going to happen, poor thing. Not even the title tipped him off. In the first chapter of this book we meet Shift the Ape and Puzzle the Donkey. We get the idea that the Ape is a mischievous thing, but after all the build up over reading this title, Bookworm1 declared the story "boring." We moved along to chapter 2 and things got dicey when a couple of Calormene heads rolled. From that moment on, Bookworm1 was riveted as was Bookworm2 who loves reading about a good battle every now and again. If battles were what Bookworm2 wanted, battles were definitely what he was going to get. I can't believe Hollywood hasn't dipped their toes into this one! It has everything the modern audience wants: good guys, bad guys, not-so-sure guys, heads being lopped off and fantastic battle scenes between fantastic creatures. While it is perfect food for Hollywood though, I'm not so sure I would necessarily trust them to this! The Last Battle has a lot of battles in it, as the title might suggest to you. It tells us of the last king of Narnia - King Tirian - who discovers the talking beast and earth men falling for a false Aslan. All of Narnia lives in fear and confusion as Shift the Ape spreads lies about Who Aslan is and what His demands are for His creatures. Shift teaches fear apart from love and places the Narnians under the heavy yoke of Calermene slavery. It is too much to bear and King Tirian is hopelessly - but bravely - fighting back with a little help from some old friends of Narnia. Throughout this book, hope is battling against despair and I have to tell you that I was becoming extremely emotional as I waded through the chapters. When Narnians began fighting Narnians my day was just about ruined. Jonathan came home from work and I told him I was really quite upset due to the fact that the Narnian dwarfs had turned against Aslan in a very violent way. The kids were wondering why I was crying. (Yes. I was pathetic. But it was really horrible and all my dread of the book was staring me straight in the face. Oh, I hated it.) I told Bookworm1 that we were going to have to speed through to the end of the book so that I could just get the inevitable over with. The kids looked at me completely mystified displaying lopsided grins of curiosity as we read on. Then. THEN! Narnia fell. Oh, friends. It was a dark day . . . but for Aslan! Somehow, someway Lewis wrote me into the depths of despair and then wrote me out of it with hope, delight and joy. Narnia came to a close but the kings and queens of Narnia then entered Aslan's country. I turned the pages (having forgotten myself how this all played out because I avoid this book as a general rule, not caring to feel it) and was greeted by my old friend Reepicheep. I paused to cry again. This time the kids were snickering at me as I wiped tears away telling them how happy this story was. Reep! He was alive and well and whole and so were all of our friends: the Beavers, Mr. Tumnus, Puddleglum and every Narnian character that we have ever known and loved (minus one, of course). Death is a villain, but Christ is the Victor. The pain of losing those we love is so very great as to be overwhelming at times. The pain makes you short of breath and has you grasping for any signs of hope. Of course, there is hope in Christ. And the picture Lewis paints of death defeated - for me - is tremendously moving. Reepicheep stood at the gate welcoming everyone in. The Old friends and warriors of Narnia ran up to greet the kings and queens newly arrived. I wept thinking about how joyful a moment it will be when I see my loved ones once again. And though I love my life here on earth very well, Lewis made me feel and begin to know that this all pales in comparison to "Aslan's country." I wept for joy; I wept for hope restored; I wept for things I haven't previously understood and still do not fully understand. I wept because death really does lose its sting and Christ really does reign victorious. The kids, of course, didn't see this as clearly as I did. However, I had them in rapt attention as I struggled to keep my voice steady while reading the last two chapters. At the end, Bookworm2 declared that we should "read it again!" as a "Bible story book!" and Lewis' plan to write a "great supposal" which would introduce children to concepts in Christianity met with instant success in our household. I smiled some more as I wiped away a few additional tears, unashamedly. I think it is important to let your kids see you weep in despair and also for joy. Tears are just another way of sharing truth with others if we'll consent to let them fall without trying to hide or wipe them away. Life is a battle but the victory is already won. I hope my kids know this every day that they are alive. I pray they will always be moving further up and further in alongside me. This life - as depicted in part in a magical world called Narnia - is the greatest adventure. "But for them it was only the beginning of the real story. 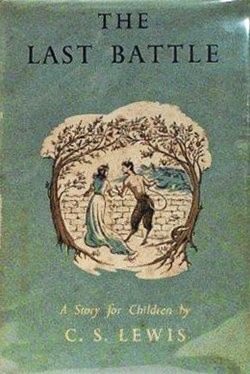 All their life in this world and all their adventures in Narnia had only been the cover and the title page: now at last they were beginning Chapter One of the Great Story which no one on earth has read: which goes on for ever: in which every chapter is better than the one before." You bring out everything I loved about this book, especially that last quote. What a beautiful reflection. The Last Battle is the Narnia book I've read least frequently and probably like the least - probably because of the depths of darkness and despair that make up the first most of the book. But it is so good to be reminded that death has been swallowed up in victory, that Christ has triumphed over this body of death. And it's so good that your children have the opportunity to see you crying in both the pain of this world and the joy of that to come. I can only echo what the others have said. Thank you for the reminder of how good this book...and how Lewis brings you out of the despair. I cry all the time while reading. I guess this makes me odd because The Last Battle is actually my second favorite in the series. Yes, there is darkness and despair. But oh that ending! I love it! And it makes the rest so worth while. I really, truly love this book. And an Aslan quote from this book is one I want on my tomb stone. "The term has ended. The holiday has begun." I know people who won't read this one because of the implicit universalism, but there is so much TRUTH and HOPE and JOY in the end of the story, that I am willing to explain to my children that Lewis was not quite orthodox in all areas. It's worth it to glean to wheat from the (very little) chaff, in my opinion. I'd like to have that last quote on my gravestone - but for now it's the header on my blog. It's probably too wordy, but I've always had trouble keeping my word count down! I read this series to our boys when they were younger. I'm thinking I need to pull them out and read them again.